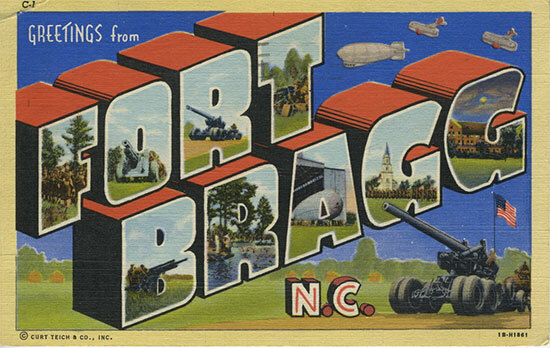 Vintage linen postcard offering greetings from Fort Bragg, activation place of the 117th Evacuation Hospital. The 117th Evacuation Hospital was officially activated on 10 February 1944 at Fort Bragg, Fayetteville, North Carolina (Field Artillery Replacement Training Center; acreage 129,422; troop capacity 4,311 Officers & 76,175 Enlisted Men –ed) per General Order Number 3, Headquarters XIII Corps, Fort Dupont, Delaware. Lt. Col. Alfred P. Thom was assigned as the unit’s Commanding Officer, Lt. Col. David D. Kram was appointed as Chief of the Surgical Service, while Maj. Otto C. Yens assumed the position of Chief of the Medical Service. 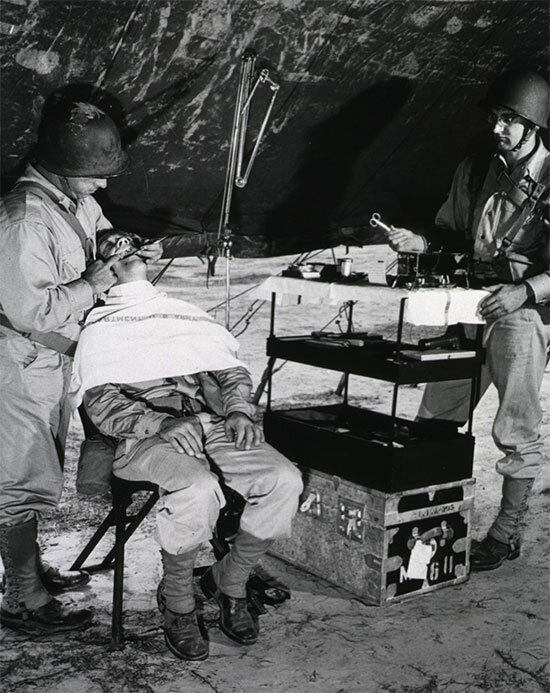 Photograph showing a Dental Clinic established under a Large Wall Tent flysheet during training operations in the Zone of Interior. All 38 Officers and 1 Warrant Officer were obtained by transfer from other medical units. 49% of these Officers were transferred from other units of the Army Ground Forces; 38% from the Army Service Forces and 13% from the Army Air Forces. 39 Nurses were received from General and Station Hospitals of the 6th Service Command, while the Chief Nurse was transferred from the Station Hospital at Fort Sill, Oklahoma. 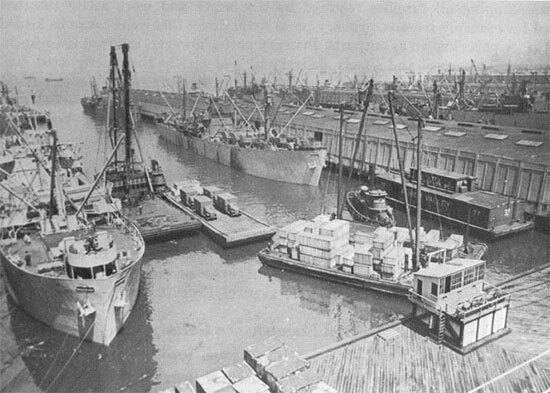 This partial aerial view of the New York Port of Embarkation clearly shows crates of equipment being loaded onto transport vessels. The New York POE was the final topping off point for the 117th Evacuation Hospital’s voyage to Europe. On 1 May 1944, the unit was reorganized in accordance with a change in T/O & E 8-581, dated 24 March 1944. This change primarily affected the authorized equipment and had very little effect on personnel. The only major change in personnel assignments was with the substitution of a Medical Administrative Corps Officer as Executive Office in lieu of one Medical Corps Officer. The unit remained at Fort Bragg into October 1944, during which period its staff underwent intense specialist training. Nurses and Enlisted Men were placed on Detached Service with the camp’s Station Hospital, and all Officers received professional training commensurate with their positions. Very little information had been supplied to the unit regarding an overseas move, but it soon became obvious that the 117th would be on the move. 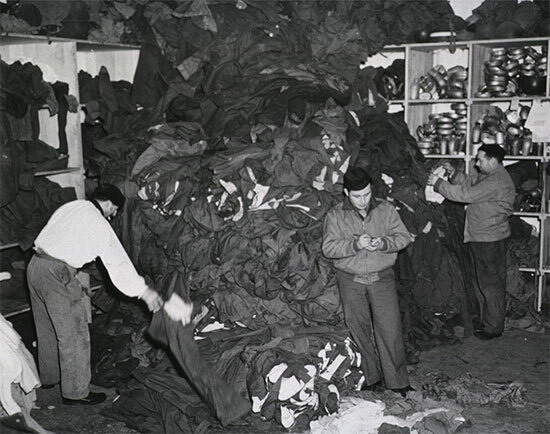 Special Order Number 200, Headquarters, XIII Corps, dated 7 October 1944, ordered a move to Camp Kilmer, Stelton, New Jersey, the Overseas Staging Area for New York Port of Embarkation. Upon arrival, the unit immediately began staging for movement to its new destination of Marseille, France. On 26 October 1944, after a total of 19 days at Cp. Kilmer, the entire organization, including all Hospital and “TAT” (To Accompany Troops –ed), was loaded onto the SS Mariposa (US Army Transport NY 525 –ed). Aerial port bow view of the SS Mariposa, the vessel which carried staff and equipment from the 117th across the Atlantic to France. The SS Mariposa finally pulled into the dock at Marseille, France on 6 November 1944. After entering her berth, debarkation was accomplished by 1400 hours the same date. The unit made a nine-mile road march to Staging Area No. 1, DBS (Delta Base Section –ed) with the exception of 40 Nurses who were billeted in Marseille on Detached Service with numerous Hospitals in the Seventh US Army area. An overnight bivouac was established and on the following morning, the organization moved via motor convoy to Staging Area No. 2 where, in preparation for receiving pre-shipped equipment, a semi-permanent bivouac was set up. Hospital equipment began to arrive on 16 November, and by 21 November 1944 loading of all equipment was completed on organizational transport. On 22 November, all personnel (with the exception of the 40 Nurses already on Detached Service) departed DBS for APO 772, Epinal, France. The movement was made via motor convoy with the Commanding Officer in charge, and also by Hospital Train, with Maj. Yens in command. The unit arrived at Epinal at approximately 1400 on 24 November 1944, after a routine move unmarked by incident. The detachment moving by trucks bivouacked overnight at Vienne and Dijon en route. Personnel of the rail movement had already arrived slightly ahead of schedule at 1040 the same day. The organization remained at Epinal, billeted with the 2d Convalescent Hospital until 26 November 1944. During this period, a reconnaissance of the Sarrebourg-Phalsbourg vicinity was made by Lt. Cols. Thom and Kram, who selected a site half a mile east of Phalsbourg. Preparation of the Hospital to receive patients was undertaken by all personnel during the days that followed. The facility at Phalsbourg was officially opened at 1930 hours on 28 November 1944, and the first patients were received at 2050 the same day. For the remainder of November, a total of 209 admissions were made, with 3 patients being evacuated to General Hospitals also in the vicinity. 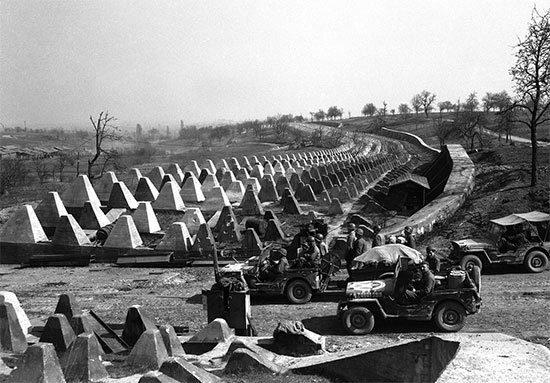 Men of the Seventh United States Army pour through a breach in the Siegfried Line defenses, on their way to Karlsruhe, Germany on 27 March 1945, which lies on the road to Stuttgart. At the beginning of December 1944, the unit’s total strength was 38 Officers, 1 Warrant Officer, 40 Nurses and 205 Enlisted Men. Two Enlisted Men had been evacuated as a result of illness, while a third was returned to the Zone of Interior for discharge. Four replacement Enlisted Men arrived from other Hospital units in the area. Despite the fact that the unit was understrength by 1 EM, it functioned smoothly throughout the month. The organization’s most outstanding achievement occurred on 19 December when a total of 246 patients were admitted. The majority of cases were battle casualties from vicious fighting on the Siegfried Line. Of the 246 admissions during this period, 152 required some type of surgical treatment, with many of the more seriously wounded requiring multiple operations. One of the biggest handicaps incurred during this time was due to the unavoidable admitting of great numbers of surgical cases simultaneously, thus flooding the pre-operative and shock sections. At 2100 hours, Lt. Col. Kram estimated the surgical lag at 43 hours, however due to the continuous work of the entire Surgical Section, this backlog was cleared in only 30 hours. The neurosurgical team, under the command of Capt. Walter E. Boehm performed operations continuously for 30 hours. On 20 December, the patient census was at 404. This figure was reduced on 21 December 1944, when a total of 180 patients were evacuated. The total number of admissions for the month of December was 2,134, of which 768 were battle casualties (with 245 having multiple wounds). Approximately 60% of the battle casualties involved wounds of the extremities, 10% were admitted as a result of abdominal and thoracic wounds, 3% consisted of neurosurgical wounds with the remainder admitted for other causes. Of the 768 American troops admitted, there were 8 deaths. Dispositions for the month totalled 1,393. Of these, 68.5% were evacuated, 14.33% transferred to Convalescent Hospitals and 13.15% returned to duty. 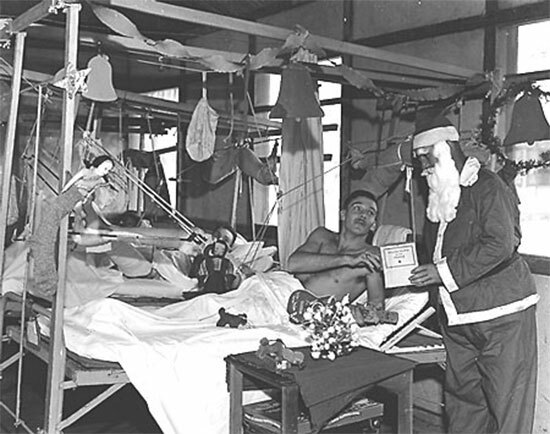 “A visit from Santa”… A wardman dresses as Santa Claus and hands out gifts to patients at an American Hospital somewhere in the ETO. Notice that the balkan frames of the beds have been decorated with various Christmas paraphernalia. On Christmas Eve 1944, the 117th Evac Hosp put on a Christmas party for all staff and patients. A quartette known as the “Four Dimensions” was obtained and together with the decorating of wards, and the singing and playing of Christmas carols, the spirit of the season was brought a little closer to the patients. Another singing quartette composed of personnel from the Hospital with an accompanist on a portable organ made rounds of the wards several times weekly, singing and playing popular songs and requests. 1945 started much the same way as 1944 had ended; the unit continued to function at Phalsbourg, France. However, on 2 January it became necessary to close the facility and withdraw to Epinal, where the Hospital re-opened at 2000 hours on 7 January 1945. Upon arrival, some doubt existed as to whether the Hospital would function or merely remain on alert status. However, 400 beds were set up and the unit prepared to receive patients, the first of which arrived at 2000. After only a very brief stay, the unit was once again moved on 17 January, this time to Saint-Jean-de-Bassel, approximately 7 miles northwest of Sarrebourg. Movement from Epinal was made via truck convoy, the first vehicles of which departed at 0730, and was completed by 1900. The Hospital was officially opened at 2000 hours with a total of 300 beds, however patients at the new location were not received until the following day, arriving at 2000. German Prisoners of War in a mess line at a camp under the command of the Seventh US Army in Sarrebourg, France. Photograph taken on 10 January 1945. Total admissions from all causes for the month of January 1945 was 702, of which 185 were battle casualties, with wounds of the extremities accounting for 65% of those. Approximately 5% each were thoracic, neurologic and maxillo-facial injuries. Abdominal wounds totalled 3%, with the remainder of the battle casualties accounted for in various other cases. One soldier died as a result of his injuries. Of the medical cases admitted, 25% were trench foot, 4% cold injury, ground type; 3% pneumonia and 2.5% nasopharangitis. Dispositions for the month totalled 1,000. Of these, 65% were evacuated, 14% transferred to Convalescent Hospitals and 15% were returned to duty. Transfers to NP and VD Hospitals accounted for the other dispositions. Admissions continued well into February and March, and the 117th remained at Saint-Jean-de-Bassel until 22 March. On this date, following up the advance of VI Corps through the Maginot and Siegfried defenses, the Hospital was moved to a new station in a cantonment area at Drachenbronn-Birlenbach, France on 23 March 1945. The move of 65 miles was completed and the Hospital reopened at the new station at 1200 hours, with the first patients being received at 1500 the same day. The facility remained at Drachenbronn for only a short period however, as orders were received to move on 29 March, with preparations beginning immediately. The move began at 0800 hours on 30 March, and the unit had received instructions not to open another station, but to rather prepare a tent bivouac in anticipation of a move across the Rhine at an early date. An area, one mile west of Göllheim, Germany was selected for the unit. The first echelon of personnel and equipment had barely arrived and started to establish a tent bivouac when orders were received to make a reconnaissance of the area in the vicinity of Weinheim and to select a site for the immediate establishment of the Hospital. This was done, and at the close of the month the unit was in preparation to move across the Rhine on Easter Sunday. The facility finally opened and was ready to receive patients by 2100 hours on 1 April 1945. From then, until 8 April, when the admission of patients was terminated, the Hospital remained at Weinheim. On 8 April, a reconnaissance was made of the vicinity of Adelsheim and a hilltop one half mile southwest of Süßen. After a move of 105 miles, the unit re-opened at 2100 hours, 25 April. Further orders were received on 29 April to terminate admissions at 2400 hours the same date. On 30 April 1945, preparations were made for the contemplated move of 140 miles to the new site at Oberau, Germany. Hospital staff at the 108th General Hospital salvage casualty uniforms. Photograph taken early 1945. Of the grand total of 2,459 patients admitted during the month of April, 1,855 were American soldiers. 1,116 of the patients admitted were battle casualties, 240 of them suffering from multiple wounds. As in previous months, wounds of the extremities made up almost 75% of the battle casualties. Maxillo-facial and neurologic injuries each accounted for 6%, thoracic and thoracic-abdominal injuries for 11% (combined), while the remainder consisted of various other types of injury. Of the 1,116 US troops admitted, 18 deaths occurred. Due to the fact that the Hospital closed and moved three times during the month necessitating the emptying of the facility each time, many patients who would normally have been returned to duty had to be evacuated or transferred, thus lowering the percentage of those returned to duty to approximately 8%. 80% of the dispositions were evacuated to the Communications Zone, with transfers to Convalescent Hospitals comprising 7.5%, and deaths, transfers to VD Centers and NP Hospitals making up the remainder. At the beginning of May 1945, the Hospital was out of operation at Süßen and awaiting the selection of a site to which it could make the next move. Orders had been received on 29 April to terminate the admission of patients as of 2400 hours that date. Consequently, preparations were made for the evacuation of 302 patients and preliminary steps for packing and moving the Hospital were started. By 0900 on 1 May all but a few patients had been evacuated and the first serial of personnel and equipment departed Süßen for Oberau. Despite the move of 140 miles, which was the longest one ever made by the unit, and the jammed conditions of the roads due to extremely heavy traffic moving through a blizzard, the Hospital was opened at 1200 hours on 2 May, having being established in a driving snowstorm. The 117th was the most advanced Hospital supporting VI Corps, and as a result of this, 111 patients were admitted in the 12-hour period from 1200 to 2400 on 2 May. From then until the end of German resistance the hospital remained functioning in Overau. For the first 10 days of the month, the total number of patients admitted was 838. Of these, all but 61 were US troops, and dispositions for the period totalled 554. 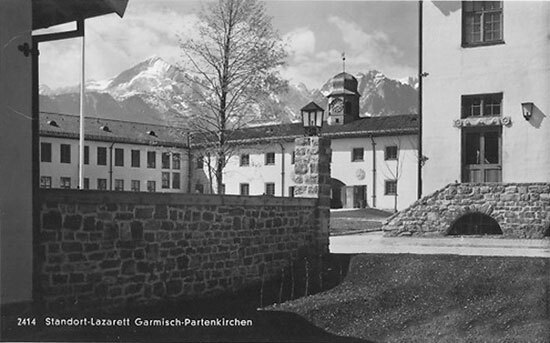 Partial view of Standort-Lazarett, a Wehrmacht hospital at Garmisch-Partenkirchen which was occupied by the 117th Evacuation Hospital from 14 July 1945. Upon completion of the plans for boundaries of occupational zones in June, the unit was finally transferred from the control of Seventh United States Army to the Third United States Army. Since the possibility of early redeployment to the PTO (Pacific Theater of Operations –ed) still remained, it was decided to continue to operate in the field. It was not until the first week of July that the unit was officially advised that it had been placed under Category IIc (United States Strategic Reserve –ed) and given a tentative shipping date of March 1946 for return to the ZI. Upon receipt of this information, plans were promptly made to move into buildings. The Hospital then moved into the Standort-Lazarett, a Wehrmacht hospital at Garmisch-Partenkirchen, Germany, finally opening on 14 July 1945. On 7 August 1945, per verbal order from the Surgeon, TUSA, the 117th Evacuation Hospital took over the facility operated by the 59th Field Hospital in Linz, Austria, and was ready to receive patients at this location on 9 August 1945. This mission was successfully accomplished in spite of the necessity for shuttling personnel and equipment on a 460-mile round trip, and in spite of the necessity of remaining open in Garmisch-Partenkirchen until relieved by the 32d Evacuation Hospital on 15 August. With the advent of VE Day, the unit found itself with only a small percentage of its personnel eligible for readjustment. By the end of September 1945, the unit’s total strength was 25 Officers, 1 Warrant Officer, 32 Nurses and 151 Enlisted Men. The 280th Medical Detachment and the 453d Dental Prosthetic Detachment were attached for duty during the latter half of October 1945, while 4 Officers and 11 Nurses were returned to the ZI for discharge. 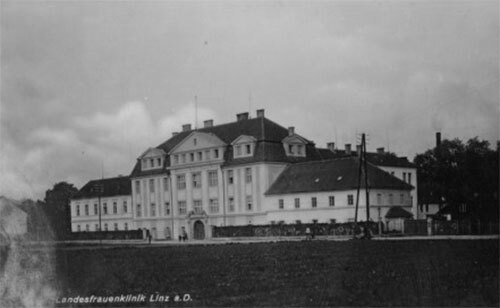 At the beginning of 1946, the unit was still stationed in the Landesfrauenklinik buildings formerly occupied by a civilian hospital in Linz, Austria. The assigned strength of the Hospital was: 22 Officers, 27 Nurses and 150 Enlisted Men. On 15 February 1946, the 117th Evac Hosp was attached to the 124th General Hospital (per Troop Assignment No. 4, USFA, dated 29 January 1946 –ed) and it then became known as Detachment “A”, 124th General Hospital. This necessitated a transfer of personnel and equipment to that organization. However, some of the Officers who were declared surplus were retained in the organization. Exterior view of the Landesfrauenklinik, a former civilian hospital in Linz, Austria which housed the 117th Evacuation Hospital during its final months of overseas operations. 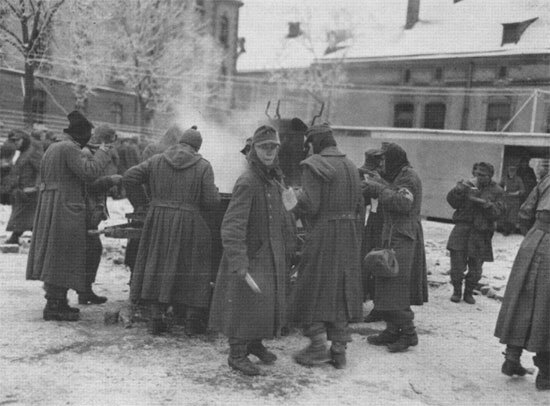 On 25 February 1946, the 117th Evacuation Hospital, Semi-Mobile received orders inactivating the unit (Section II, General Order # 19, Headquarters, USFA, dated 26 February 1946 –ed). All inactivation proceedings were carried out in accordance with AR 345-400 (Section 4, Paragraph 38 –ed). The MRC staff wish to extend their most sincere thanks indeed to John Tomawski, grandson of 1st Lt. Joseph J. Tomaszewski (ASN:O-1535318) who served with the 117th Evacuation Hospital during WW2. John was able to share numerous original documents with us, thus allowing the editing of this concise Unit History. We are still looking for a complete Personnel Roster, and would be grateful of any assistance locating same.